"He can get into any disguise... getting out is another story." 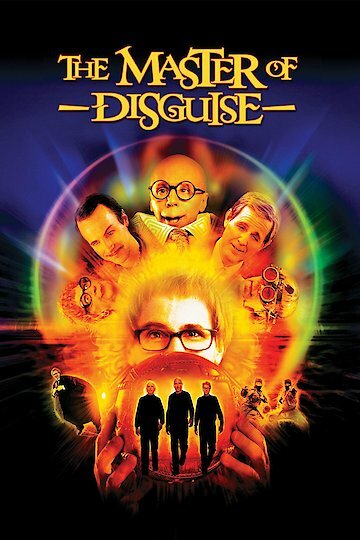 The Master of Disguise is a comedy about a family known for their ability to disguise themselves as other people. The main characters include James Brolin as Fabbrizio Disguisey, the father, Harold Gould as the Grandfather and Dana Carvey as Pistachio Disguisey, the son. The movie opens with a flashback from the father’s past in Palermo, Italy in 1979. Because of these events, he makes an enemy named Delvin Bowman played by Brent Spiner. Fast forward twenty years and the story continues with Fabbrizio owning an Italian restaurant that Pistachio works at with his family in anywhere American city. One night his parents are kidnapped by Delvin Bowman and his men. Because Pistachio grows up without any knowledge of his family’s secret agent talents, he must quickly learn about himself and his family’s legacy from his Grandfather. Pistachio trains to become a master of disguise. He creates many characters using his father’s nest, which is a secret room in the house. His Grandfather hires an assistant to help named Jennifer Baker played by Jennifer Esposito. Hesitantly, she accepts the job along with her son, Barney played by Austin Wolff. Together they gather and investigate clues and use disguises to find out what happened to his mother and father. Meanwhile, Fabbrizio is blackmailed into disguising himself as famous men and women in order to steal national treasures for Bowman’s underground collection. Eventually, the plot climaxes with a family reunion and face-off between good and evil. In the end, Pistachio finds his family, becomes a master of disguise and marries Jennifer. The film highlights many celebrity cameo appearances including Jessica Simpson, Bo Derek, Paula Abdul and Jesse Ventura. Dana Carvey portrays at least twenty different characters. Digital computer effects and an abundance of one-liners make this movie adolescent in nature and family-friendly. The Master of Disguise is currently available to watch and stream, download, buy on demand at Hulu, Vudu, Google Play, FandangoNow, iTunes, YouTube VOD online.